To delete, add or reorder images from a case, click the image select icon from the edit case page. All images are viewed in the grid displayed. This is the initial display mode. 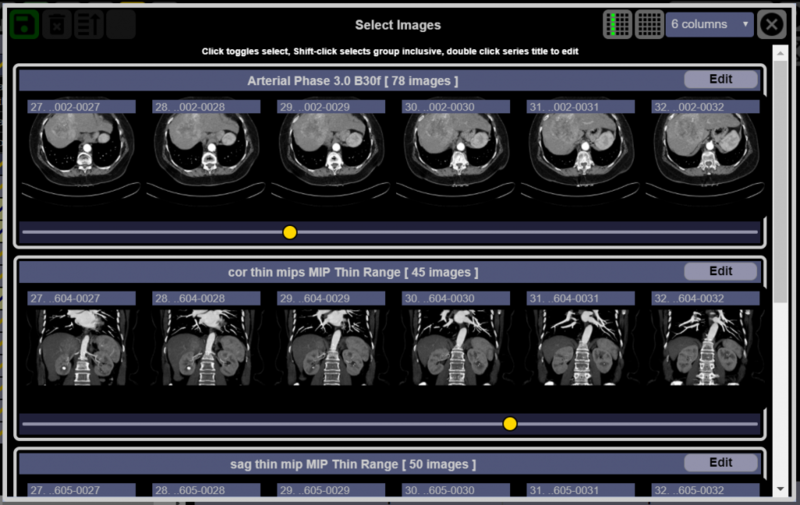 If the viewed is switched to the Series View Mode (below), Image View Mode can be selected by clicking the Image View icon. The images are displayed with a scroll bar below the row of images. Dragging the scroll bar shows the images in the series. Alternatively, by pressing Shift or Control while moving the scroll wheel on the mouse, the images will advance in the same image panel. The images will all scroll horizontally together. This is useful when sorting and deleting multiple phase studies. Click an image and its border will be highlighted. Select a series of images by clicking the first, then hold down the Shift key, then select the last image. The border of the selected images will be highlighted. Select multiple images by holding down the Control key and clicking images. At the top of the images, the numbers indicate Image Number (Example – 9, 10), and filename (0002-0002-0009 and 0002-0002-0010). After the images are selected, click the delete icon to delete images. Drag and Drop images onto the window to add. 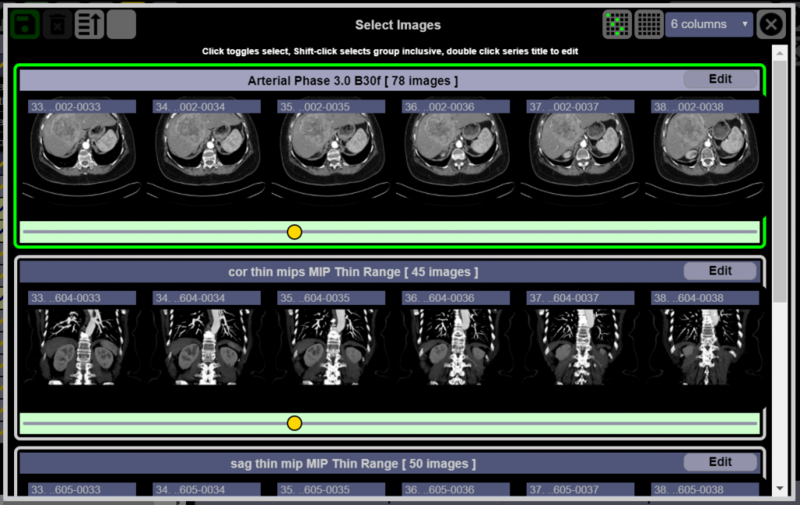 DICOM, JPG, PNG and TIFF images can be added. 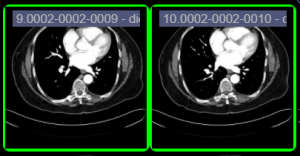 DICOM images are processed the same as when they are sent to RadPix from a DICOM device. This includes DICOM header anonymization and automatic region blackout. Images can also be added from a PC by clicking the Add Images icon A browse window allows the user to select images and add them to the case. Click and drag images to reorder. Click the save icon when done. Dropdown menu to select number of columns. Click to change.